Since her the days when she learned instrument repair and luthiery while apprenticing a violin maker, Kathy Wingert has remained enthralled with how each individual guitar has a unique voice and personality all its own. Almost 20 years later, realizing the full potential in a top and tonewoods to achieve the best voice possible in every guitar she creates remains a passionate focal point to her craft as a world class luthier. Operating out of Rancho Palos Verdes, California, a botanic seaside community at the southern tip of Los Angeles, Kathy Wingert makes guitars in all manner of sizes from genuine parlor guitars on up to harp guitars of impressive proportions. She employs a variety of materials among the historic tonewoods and top wood, as well as more specialized options like sinker redwood, 500 year old “Sonic Sitka,” and even white ebony, which is virtually impossible to work with unless the wood charmer is both highly skilled and extremely patient. Although she makes guitars to be sold, she has a two-year waiting list for commissions. Even with non-customs, no two guitars are identical, inside or out, as she allows the organic materials to guide her as much as her own eyes and ears regarding cosmetics and aspects relevant to tone and sound production. When it comes to custom orders, Wingert enters into conversation with a client and offers suggestions. Once a client’s perspective and desires have been made clear, the luthier begins looking for a suitable top, typically using tapped tone, stiffness and cosmetic appeal, in that order, yet putting more or less emphasis on looks based on client preferences. For the most part, her building technique is rooted in time-tested traditions. 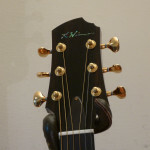 For example, her tops are supported by the X-brace pattern invented by C.F. Martin in the mid-nineteenth century, and refined by his decedents and their various competitors. But Wingert carves each brace and tone bar differently to hone in on the type of voice and resonance she wishes to build into a specific instrument. She also employs the traditional hand-fitted dovetail neck joint, which promotes considerable energy transference between the neck and the guitar’s body. Furthermore, she uses hot hide glue throughout her builds, which requires much more time and effort than modern synthetic glues, but she feels it is worth it. Along with these traditional techniques Wingert employs progressive methods as well. While she continues to use her own ears as she planes the top, she will include an electronic signal generator to produce Chladni resonance patterns in many cases. Likewise, she encases her necks in rigid veneers and inserts both graphite support and a dual action truss rod. Trim and aesthetics found in Wingert guitars range from woody and traditional to elaborate and ornate. And in modern times she has relied upon the expert eye and skillful hand of a particular inlay artist to handle much of the fancy stuff, who happens to be her own daughter Jimmi.